Your own 83 acres to explore in peace. 4 bedroom modern, single level family home in idealic isolated setting only 12 minutes from Wingham or 20 minutes from Taree. Wheelchair accessible. Enjo cleaned. 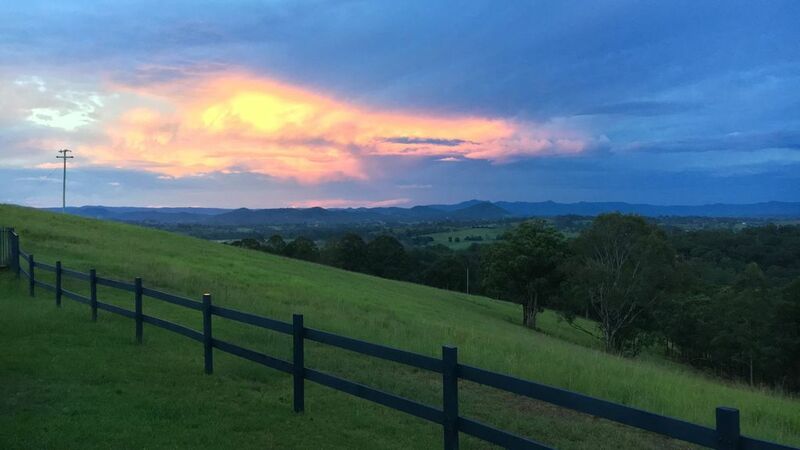 Nestled over looking rolling hills of Manning Valley, this property has very private 83 acres for relaxing enjoyment. No neighbour in sight. Read and snooze at Heaven on a hill. Rivers, Old Bar Beach and Wallaby Point near for swimming. Gum boots are provided, this area is full of wild life, wear covered foot wear and long trousers for walks. No responsibility taken by owner while guests freely enjoy this lovely property for a holiday. Please take care. Guests accept the natural environs are beautiful yet might be hazardous and so stay at own risk. The land is home to an array of wildlife, lizard, echidnas, kolas, eagles to name a few. Swimming pool and WiFi. Swim responsibly so only competent supervised swimmers can use pool. Fully equipped kitchen with some fresh food and breakfast items supplied. Pantry items. Medical kit provided in the event of need. Good Telstra mobile reception and WiFi. Stan and Netflix. Come home again feeling that the stress of life has melted away in this quiet peaceful location overlooking a valley. House is comfortably furnished with books and games and a massive TV. Tastefully decorated with outdoor Weber bbq and a fire pit. Again be responsible with fire. Strict fire bans apply at times so be familiar with local warnings and rules. We enjoyed walking around and discovering Koalas, Wallabys outside the front fence, views,serenity. We had the best time at this lovely house. It was far better then we expected we loved playing in the pool all day and sitting together inside watching nextflix it was the perfect combination. Absolutely loved our time here. The house, the view and the atmosphere is just so wonderful and peaceful. My husband, kids and I will definitely be back for another visit!! The house had everything that we needed and the kids had a ball riding their bikes. Amazing is an understatement. Truly beautiful peaceful home with everything you need. I took my family away to celebrate our years achievements. The home was perfect for us to enjoy each other's company and leave the world behind. This place had everything you could think of, totally perfect in every way. Highly recommended. This was such a refreshing stopover en route to Sydney. Mum and dad relaxed, and the three kids potted around and had a ball. Not a neighbour in site - pure bliss. We will be back! We had 4 guys working nights in Taree and they said it was the best house they had ever stayed in over Australia. A few got home and went up the large hill at the back and watched the sunrise and said it was amzing! The owners were lovely and SO helpful. We will be back if we can!! Thank you for sharing such a beautiful part of the world with others. Nestled quietly into dairy country. Beautiful peaceful vistas with wild life abundantly around the property. Not far from large regional towns of Wingham and Taree. Half an hour to beach and falls.